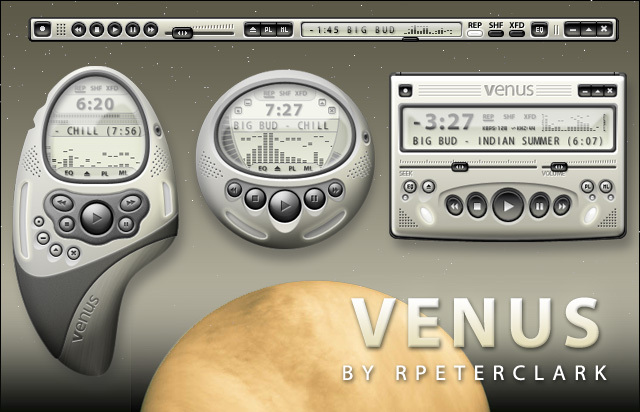 Introducing Venus for Winamp 3 & Winamp 5. Features 4 unique modes, dozens of color themes, beat visualizer lights and an integrated mini-site for updates, extras and feedback. This initial release is meant to be Winamp 3/5 compatible. But to do that I had to omit some WA5 features that are not backwards compatible. Once a WA5 compiler is released, I will update Venus to a WA5 only skin that incorporates features like the "skin options" menu and notification popups. The skin looks REALLY nice but.....doesn't seem to work for me (WA v5.01). Switches OK then "locks" (Not Responding) 3 times so far. Awwwesome. By far my favorite new WinAmp skin. It uses the powers of WA5 and is very clear and nice. Congrats. This is a fantastic skin that I will be use from now on. Very nice, but there's no color theme manager actually.. Or am I blind? Very nice skin with beautifull color!!! The first skin from this site that I've liked! (As well as the first skin I've used on winamp) very cool indeed! I love this skin too.I wish there was a color scheme that was pure blue but thats just me. help me!! !please!can NOT install this skin?? ?don't winamp e.file??? Awesome skin! But where's the color theme mngr? nevermind... found it. with that in mind, this has to be the best winamp skin ive seen. and will start using winamp again because of it!! Ok, I've always used WMP before--can you tell me how to switch between the 4 modes? Great by the way. Very nice work. Its skins like these that make me want to start using Winamp. Very, very good stuff. Congrats. Sure im stupid, but doubleclcking on the top made me cycle thru "minimal mode"(top of above picture), then the one "left of above pict", and im blocked, id like to go back to normal one (right).